In 1943, Max Carver's father - a watchmaker and inventor - decides to move his family to a small town on the coast, to an abandoned house that holds many secrets and stories of its own. Behind the house Max discovers an overgrown garden surrounded by a metal fence topped with a six-pointed star. In the centre is a large statue of a clown set in another six-pointed star. As the family settles in they grow increasingly uneasy: Max’s sister Alicia has disturbing dreams while his other sister, Irina, hears voices whispering to her from an old wardrobe. With his new friend Roland, Max also discovers the wreck of a boat that sank many years ago in a terrible storm. Everyone on board perished except for one man - an engineer who built the lighthouse at the end of the beach. 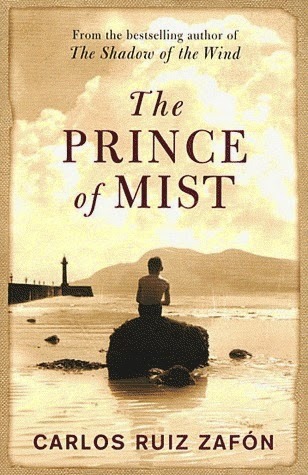 The Prince of Mist captivated me right from the first chapter. I was reading it in bed and planned to complete the book over two nights, but I got so involved in the story, I ended up staying up late to finish it in one session. The story is entrancing and even a little chilling at times. I certainly cast a few wary looks around the room as I read. The characters are well-drawn and believable and the story is nicely paced. All in all, this book is an entertaining and occasionally spooky read that will thrill readers young and old.